Cowlitz Country News - "The Voice of Cowlitz Country"
Chinook: ‘Extinct’ U.S. tribe gets another shot at recognition - The Chinook tribes greeted Lewis and Clark when the explorers arrived at the Lower Columbia River in 1805. The tribes helped members of the expedition through the winter, bringing them food and assisting with navigation. More than 200 years after that first contact, the five tribes that now make up the Chinook Indian Nation have a constitution, a tribal council and annual meetings. They are not, however, recognized by the U.S. government. "They say we are extinct, but my family still lives on our indigenous land," Coun. Kate Elliott said. The Chinook tribes' lack of recognition could change under proposed revisions to the 35-year process the U.S. Interior Department uses to officially recognize Indian tribes. Announced May 22, they are part of an effort to make tribal recognition more efficient and transparent. Chinook: Camas to rise again in Ridgefield - Visitors to the Cathlapotle Plankhouse on Sunday didn't just learn how native tribes incorporated roots of the camas plant into their diets. They had a chance to get their hands dirty as they planted dozens of the purple-flowering bulbs in a field overlooking the plankhouse, centuries-old oak trees and the Columbia River. Clatsop-Nehalem: Proposed center offers lessons - A group of city officials, parks committee members and tribal representatives have met several times, an application for a state grant to buy the property from the school district is being prepared, a path around the property is being planned, and even the fence that surrounded the school has been removed to prepare for development. Clatsop-Nehalem: Elementary school site to be a public park for now - The dream of turning the vacant Cannon Beach Elementary School site into a Native American cultural, educational and recreational center honoring the Clatsop-Nehalem Tribe is very much alive. But the city and the Seaside school district have been unable to agree on a price for the southern half of the property that the school district owns. Coeur d'Alene: Idaho's Circling Raven Golf Club earns honors from TripAdvisor - Circling Raven Golf Club - the highly acclaimed amenity course of Coeur d'Alene Casino Resort - has garnered the TripAdvisor Certificate of Excellence for a second straight year. Coeur d'Alene: Chief Andrew Seltice led tribe into the modern age - The Coeur d'Alene Indians say that Chief Circling Raven lived to be 150 years old, ruling his people from 1660 to 1760. With the gift of prophecy, he warned of grave dangers ahead. He also said one day the Black Robes will come. Andrew Seltice was born about 1810, not long after his Schitsu'umsh people saw their first white men when Lewis and Clark passed through. He was not like the more famous warrior chiefs Geronimo, Crazy Horse and Sitting Bull. He preferred diplomacy to battle. Coeur d'Alene: Tribe’s plan to offer poker at casino at odds with Idaho - The casino is advertising a May 2 opening date for its new poker room, with executives saying that Idaho’s constitutional ban on poker games doesn’t apply to the tribal-owned casino. Colville: 3 Wellpinit students receive full ride college scholarships - Only 1,000 students received Gates Millennium Scholarships nationwide and three of them came from Wellpinit High School. The three Wellpinit High School standouts were members of the Colville Tribe and attended school on the Spokane Indian Reservation. Colville: Woman killed in single-vehicle crash near Long Lake identified - A woman is dead following a single-vehicle collision with a tree southwest of Long Lake on Thursday night, the Spokane County Sheriff’s Office said. Deputies received a call of the collision shortly after 8 p.m. Jolene Picard, 27, was heading northwest on West Long Lake Road near West South Bank Road, drove off the south shoulder, overcorrected and went off the north shoulder. Colville: Ron Flavin Helps Tribes Secure $500K Telemedicine Grant - The Colville Indian Reservation land base covers 1.4 million acres in North Central Washington, occupied by more than 5,000 residents living in small communities or in rural settings. The grant proposal was written by Ron Flavin, a business organization strategist, who has had a 100 percent success rate with the USDA's Community Connect program and has previously obtained a $1.4 million award for the Confederated Tribes of the Colville Reservation. Colville: Tribes Plan First Hotel With Casino - “This will be our first hotel,” Mike Finley, chairman of the Colville Business Council, said. The Confederated Colville Tribes own three small casinos but no hotels. Surface preparation and some excavation for the site of the new Omak Casino Resort will begin about April 15, so cars can reach the location and people can attend the ground breaking projected for early May. The anticipated opening is about 12 months later. Coos, Lower Umpqua & Siuslaw: A Small Tribe Thinks Big About Their Ocean Space - Margaret Corvi, a tribal member and Environmental Specialist, is one of three tribal natural resource staff, and the only one actively working on ocean and coastal projects. Despite the limited capacity, she has been participating in meetings of the West Coast Marine Planning Tribal Partnership – a group of 10 tribes working to draft marine plans for their individual tribal territories. Coquille: Proposed Medford casino: the letters - It's been just over a year and a half since the Coquille Indian Tribe announced plans to build and open a casino in Medford. The idea has received backlash from the neighboring Cow Creek Band of Umpqua Tribe of Indians. Coquille: Chief Kenneth Tanner - The Coquille Indian Tribe lost its long-time tribal chief this weekend. According to the tribe, Kenneth Tanner died Saturday morning after a long battle with an unspecified illness. Coquille: iModules Software Announces New CTO - iModules Software, the leading provider of online collaboration and engagement tools primarily for higher education, today announced the hiring of a new Chief Technology Officer (CTO), Troy Anderson. Anderson is responsible for the company's technology strategy, software development, architecture, QA, and infrastructure activities. He is also is a published author - The Way of Go - and a champion of indigenous language revival for his Tribe, the Coquille Indian Tribe. Cowlitz: Crafts of the past on view through summer at Tacoma’s Fort Nisqually - Every weekend from May 3 through September 28 a different artist will be in residence demonstrating a craft or art from the 1800s, the period when the Hudson’s Bay Company had an outpost at the now-restored historical site. Crafts include Native American basketry, metal engraving, millinery, botanical illustration, broom making, and blacksmithing. On May 18, Cowlitz tribal member Judy Bridges demonstrates basketry techniques like plaiting, twining and coiling. Cowlitz: Ceremony carries on healing - I’m so glad The Columbian captured the spirit of Chief Redheart’s band of the Nez Perce during their annual visit to Fort Vancouver on April 19. The ceremony to commemorate the incarceration of their ancestors in the winter of 1877-78 was moving. The camera lens captured not only the beautiful horses, but the Cowlitz Tribe children who danced an Eagle Dance in very wet grass, then sat quietly under umbrellas through the cold and driving rain — weather that gave us an example of what the Nez Perce endured during their imprisonment. Cowlitz: Legislative committee gives casino idea a hearing - Cowlitz Chairman Bill Iyall appeared Friday before the state Senate Commerce and Labor Committee in Olympia for the first of three public hearings on a proposed tribal-state compact. Iyall said regardless of whether a federal court challenge kills the tribe’s plans to take land west of La Center into trust and build a casino, a compact with the state gambling commission will let the tribe lease its allotted 975 terminals to tribes that do have casinos. 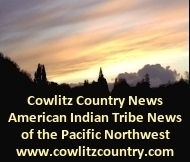 Cowlitz: Tribe pushes for tribal-state compact - Cowlitz Chairman William Iyall testified before a House committee Monday in Olympia in support of a tentative tribal-state compact being considered by the state gambling commission. Cowlitz: Casino Lacks Justification - As The Columbian long has argued editorially, the question for local residents isn’t about expanding entertainment opportunities in the region or appeasing a tribe that professes to have ties to Clark County. Instead, the crux of the issue revolves around the quality of life in the region and what is best for local residents and their communities. Cowlitz: State gambling with county's well-being in casino plan - The tribe could build two casinos, one with as many as 75 gaming tables and one with as many as 50. There could be a total of 3,000 “tribal lottery player stations,” which are slot machines in all but name. And there would be a certain percentage of the gross revenues going toward community mitigation (law enforcement, emergency services, etc.) and addiction services. None of this is set in stone. The proposal remains, for now, locked up in federal court. Cowlitz: Sacramento State Gymnast First From School To Compete In Nationals - A Sacramento State gymnast is vaulting her way into the history books as she’s the first from the school to compete in the NCAA gymnastics nationals. For Junior Kalliah McCartney, 21, her tough training is paying off. “I was almost speechless when I found out I made it to nationals,” she said. Culture: Huckleberries - The most important berry crop for most of the Plateau people of Washington, Idaho, and Montana was the huckleberry (Vaccinium membranaceum), a type of blueberry. These berries were collected in August and September for winter consumption. Huckleberries plants are small to medium sized shrubs which are found in the moister mountain areas, particularly in areas with acidic soils and areas which have been burned by forest fires. Duwamish: Even Superpowers Can't Separate Seattle From Its Dark Past - How is Seattle’s real-life tribe doing? Not well. The Duwamish tribe has been declared “extinct” by the federal government. This is despite the fact that there are still almost 600 Duwamish alive. Duwamish: Unrecognized tribes: It's due time for recognition - As a retired Bureau of Indian Affairs employee, I am aware of the long, hard fight Cecile Hansen has had in trying to receive federal recognition. Economic Development: Tribal business a big niche in the South Sound - One South Sound business niche that not only survived but managed to thrive during the recession has been tribal project expansion. And, with five Tribes scattered throughout this region alone, that fact has businesses here looking to partner with them on projects across major industries. Education: Northwest Indian College Space Center Rocket Goes Supersonic - Nine Northwest Indian College students and their advisor arrived at the First Nations Launch in Milwaukee, Wisconsin on April 2, 2014. This year three teams were entered into the competition: Tribal Climate Change, AISES (American Indian Science and Engineering Society), and the Supersonic Challenge. The competition was held on Saturday, April 5 on a relatively sunny day. Education: Hundreds attend totem pole rededication at Peninsula College’s Port Angeles campus - More than 300 tribal, city, county and educational dignitaries took part in a rededication of a totem pole at Peninsula College on Tuesday afternoon. Fisheries: Tribal leaders say efforts often hampered by bureaucracy - Tribes are sovereign, or self-governing, nations. But federal and state bureaucracies often slow or inhibit their ability to respond to needs on their lands, Tribal leaders told federal officials at a Tribal Summit at the Suquamish Tribe’s House of Awakened Culture, April 24. Billy Frank Jr., chairman of the Northwest Indian Fisheries Commission, said the commission has not received a response from the White House three years after the commission presented a white paper offering solutions to salmon habitat degradation. And that’s putting treaty rights at risk. Fisheries: Research develops genetic tools to aid In recovery of pacific lamprey in Columbia river basin - A set of 96 genetic markers, or single nucleotide polymorphisms (SNPs), winnowed by Columbia River basin researchers from a list of 4,439 previously identified in Pacific lamprey could help give researchers insights into the lives and life influences faced by the diminished, but highly valued, fish species, according to a research paper made available last week online. Fisheries: Keep big oil trains out of our way - If coal export terminals proposed for Cherry Point near Bellingham, and Longview on the Columbia River are approved, hundreds of trains and barges would run from Montana and Wyoming every day, spreading coal dust along the way. That same coal will continue to pollute our world when it is burned in China and other countries thousands of miles away. Fisheries: Lower Klamath tribes speak against new Klamath legislation - Upper Klamath Basin tribes have come out in recent weeks touting new legislation authorizing federal involvement in three Klamath agreements, but the enthusiasm has not been shared by all of the tribes downriver. Government: Proposed changes may help tribes get federal recognition - Proposed changes to the 35-year process the U.S. Interior Department uses to officially recognize Indian tribes could affect Washington tribes that have sought federal recognition for years. Government: Declaration seeks inclusion of tribes in updated Columbia River Treaty - Wrongs done to indigenous people during the dam-building era should be addressed during negotiations for a new Columbia River Treaty, according to a declaration signed last week in Spokane. Government: DOI Asks Senate To Upend Supreme Court's Tribal Rulings - Kevin K. Washburn, assistant secretary of Indian Affairs, asked the Senate Committee on Indian Affairs to pass S. 2188, which would amend the Indian Reorganization Act to reaffirm the secretary of the Interior's authority to take land into trust for tribes — a power that was cinched by the Supreme Court's 2009 Carcieri v. Salazar decision. Government: Tribes irked by slow start to U.S. land buyback program - Many of the nation’s tribal leaders say the Obama administration is moving far too slowly with a massive plan to spend $1.9 billion to buy back thousands of parcels of land that have been sold over the years on U.S. Indian reservations. Government: Washington state tribes ask for action on climate change - The tribes, with low-lying reservations on Washington’s ocean coast and along Puget Sound, said rising sea levels caused by global warming, ocean acidification and more severe weather patterns are endangering the natural resources on which their cultures are based. Fawn Sharp, president of the Quinault Indian Nation, said the magnitude of the problem has led to a kind of paralysis. “It’s so big, we’re left wondering, ‘Where do we even begin?’” Sharp said. Government: Interior Department proposes rule changes for federal recognition of tribes - The U.S. Interior Department on Thursday announced proposed changes to the rules for granting federal recognition to American Indian tribes, revisions that could make it easier for some groups to achieve status that brings increased benefits as well as opportunities for commercial development. The Bureau of Indian Affairs says it overhauled the rules to make tribal acknowledgment more transparent and efficient. Government: Affordable Care Act Outreach & Enrollment: Lessons Learned and Next Steps for Urban Indian Populations - This webinar will provide a brief overview of how outreach staff and health professionals can help AI/ANs get coverage outside of open enrollment and next steps for assistance following enrollment. We will also hear from several Urban Indian Health Organization (UIHO) Navigators and Assisters about their outreach and enrollment work and lessons learned in order to support ongoing outreach and enrollment efforts. Government: Interior secretary calls for more land to be placed in tribal trust status - Earlier this year, the Suquamish tribe added 283 acres to its Port Madison Indian Reservation, expanding the reservation for the first time in 150 years. That’s a tiny fraction of the 242,703 acres that tribes nationwide have brought into trust status since 2009. Before the Obama administration leaves office in 2017, Interior Secretary Sally Jewell wants to see that number double. Government: 5 Washington tribes to benefit from federal land-buying program - Five Washington Indian reservations are among 21 nationwide that will be the focus of the next phase of a $1.9 billion program to buy fractionated land parcels owned by multiple individuals and turn them over to tribal governments, Interior Department officials said Thursday. Comment: Unfortunately at least one tribe is lying to individual Indian land owners, telling them that they must sell. Grand Ronde: For Native Americans, Losing Tribal Membership Tests Identity - In western Oregon, members of the Confederated Tribes of Grand Ronde are engaged in a debate over what it means to belong. The tribe's enrollment committee is considering kicking out an entire family that traces its lineage back to the founding of the modern tribe more than a century and a half ago. The family is related to Chief Tumulth, leader of the Watlala, a tribe that controlled river traffic along a key section of the Columbia River. Grand Ronde: Woman raises $3,400 for police dog - A tribal member from Grand Ronde has raised $3,400 to purchase a bulletproof vest for tribal police dog Nixwa. Veronica Gaston, embarked on the fundraising mission after a recent shooting killed a police dog in Portland. Grand Ronde: Tilikum Crossing or Tilix?m Crossing? Why Portland's new bridge name doesn't have traditional native spelling (video) - Initially, the spelling of Portland's bridge name was proposed as “Tillicum.” In the end, however, the committee charged with choosing a moniker for the car-free 1,720-foot transit bridge over the Willamette River selected Tilikum Crossing. Grand Ronde-Nooksack: Dismembering Natives: The Violence Done by Citizenship Fights - In the Pacific Northwest, the Grand Ronde and the Nooksack are in the process of striking hundreds from their rolls. Some tribal governments are appropriately working to decipher their membership records and clarify their identities. Whatever the motivation, those cast out are culturally adrift and politically uncertain as to their remaining rights as either tribal, state, or federal citizens. Government: Federal Acknowledgment of American Indian Tribes - This proposed rule would revise regulations governing the process and criteria by which the Secretary acknowledges an Indian tribe. The revisions seek to make the process and criteria more transparent, promote consistent implementation, and increase timeliness and efficiency, while maintaining the integrity of the process. Note: Thanks to Deborah Sosa for this and other links.